Join us June 16th 2018 for our 9th annual Flying Proms Airshow at the Military Aviation Museum! Join the Military Aviation Museum for our 9th installment of The Flying Proms Symphony Air Show! 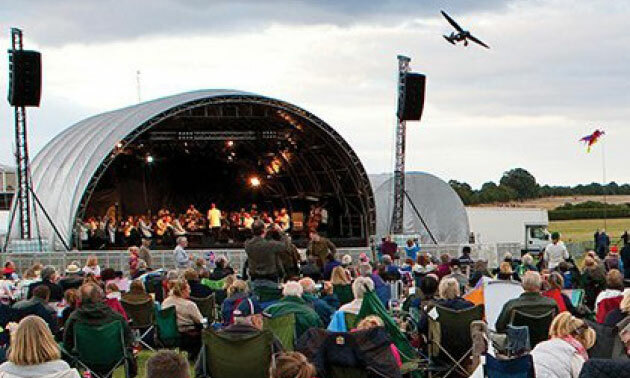 The Flying Proms offers guests a truly unique experience. 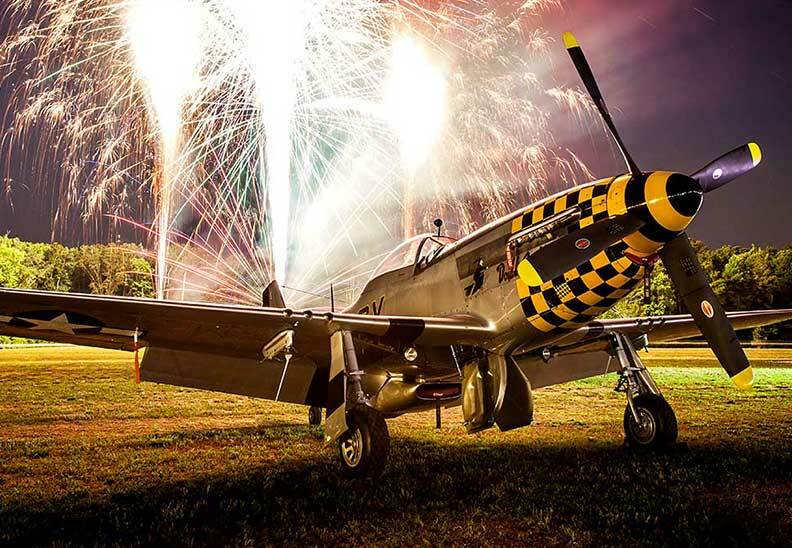 Getting its roots from the United Kingdom‘s traditional Proms, the Military Aviation Museum’s Flying Proms is the only event of its kind in North America. The first half of the evening’s entertainment will feature aerial displays from the museum’s collection of historical aircraft, such as the DeHavilland Mosquito and Messerschmitt Bf-109, accompanied by musical selections from popular aviation-themed movies. As dusk falls, and the planes land, the second half of the performance will commence, featuring an assortment of patriotic and pop music. Festivities culminate with a fireworks finale provided by Zambelli Fireworks. What is The Flying Proms? 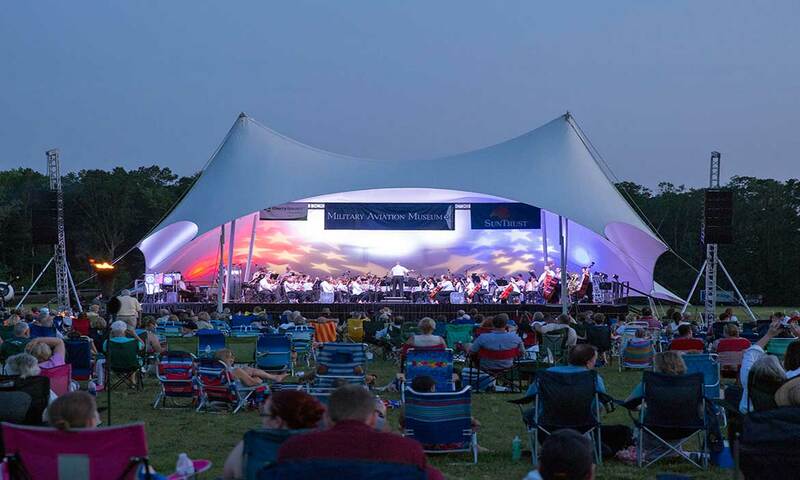 The Flying Proms Symphony Air Show, a unique experience in America, has its roots in mid 18th century England. At that time, English commoners rarely had the opportunity to experience live orchestral music, except that which was played in public London gardens and parks. These symphonic concerts were designed so that people could enjoy the music while strolling through the gardens, and were referred to as Promenade Concerts, from the French se promener “to walk” (now lovingly referred to as the Proms). The popular British tradition took its more recognizable form in 1895, when the first Promenade Concert was held in the Queen’s Hall in London. Its first conductor, a young Henry Wood, would continue to lead the orchestra until his death in 1944. The Promenade Concert endured, and even after the falling bombs of the German Blitz crushed the Queen’s Hall, the orchestra played on and continues to this day. In 1997, a new tradition was born. The Shuttleworth Collection, a prominent aviation museum in Bedfordshire, England, took the beloved British traditional Promenade Concert and put a distinctly aeronautical spin on it. Bringing the concert back to the outdoors in the original spirit of the day, the museum added a flying demonstration set to the music of famous aviation themed movies. The conclusion of the concert is punctuated by a grand fireworks display, reminiscent of the original Promenade Concerts held so many centuries ago in those London Gardens. The Military Aviation Museum is proud to bring this British tradition to America, and in its 9th season, this event is more popular than ever. Please join us for a spectacular evening of music, historic aviation flights and community. The Virginia Wind Symphony, organized in 1994 by Dennis Zeisler, is a wind ensemble made up of professional musicians, military musicians, public and private school teachers, and independent music instructors. The group was created to provide a musical outlet for musicians from throughout the Hampton Roads area and is dedicated to playing the finest original and transcribed wind literature available. Members benefit from the positive musical experiences brought about by music-making in the spirit of camaraderie and from the opportunity to serve the region through a lifelong love of music with concerts throughout the year. The Virginia Wind Symphony has been conducted by ABA members Johan de Meij, Terry Austin, Arnald Gabriel, Ed Lisk, Frederick Fennell, Ed Downing, Linda Moorhouse, Harry Begian, Frank Wickes, James Keene, H. Robert Reynolds, David Holsinger, Lowell Graham, Brian Walden, and Thomas Palmatier as well as other distinguished conductors from around the world. The Virginia Wind Symphony has recorded six commercial compact discs. Mark comes to us from the rural countryside of England. He has flown military jets and worked in commercial aviation, and he spent 26 years as a program editor with BBC Radio. 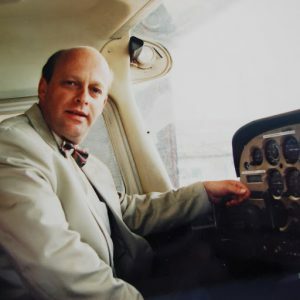 Mark is involved in the world-famous Shuttleworth Collection of historic aircraft and cars in England, where he has been a commentator for its air shows. Since first visiting the museum in 2011, Mark has been a loyal supporter and friend helping announce air shows and Flying Proms. Will I need to pay to park? On-site parking is available at no cost. If needed, overflow parking will be available nearby. Please carpool if able. We can accommodate just about any vehicle for parking, but if you think you have a special need, please do not hesitate to call us at 757-721-7767. Is there parking for motorcycles? Absolutely. All parking is off the pavement, but we have a designated area under our water tower with wood blocks for your kickstands. Bring your picnic baskets, blankets, lawn chairs, camera, binoculars, bug spray, Tiki torches (after dark) and money for food and souvenirs. There will be an ATM on-site. Yes, you can bring a cooler, but absolutely NO alcohol may be brought in. We will ask to look in the cooler. 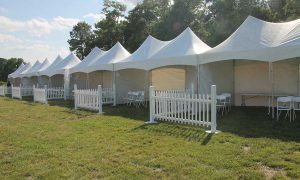 We do our best to bring in a variety of quality vendors and would appreciate you supporting them at the event. As with all of our events involving our aircraft, flights are subject to weather conditions. No refunds are available for tickets, but most of the time, if one day gets rained out, your ticket will be valid for the next day. In the event of severe weather please be sure to check this website and the Museum’s Facebook page for notices rescheduling. Can I bring a canopy umbrella? No, nothing that might obstruct the views of other guests. A limited amount of handicapped marked spaces will be available and golf carts are available to take guests needing assistance to the viewing areas.